It’s a snowy Wednesday night in southeast Calgary, but a group of young lacrosse players are busy working up a sweat as they run through an hour-long training session. Among the instructors is an unassuming, relaxed looking Wesley Berg. However, when Berg speaks, he instantly commands the attention of the players. At age 24, few people have amassed the kind of resume that Berg possesses, and the kids relish the opportunity to learn from one of the best lacrosse players in Canada. The process that Berg speaks of has started to pay dividends in Alberta. With recent breakout performances at the midget and junior levels, Alberta has made great strides forward on the national stage. Although Alberta lags behind in generational coaching, a host of former and current high-level players, like Berg, provide the knowledge and proficiency that bridge that gap. Despite his busy schedule, Berg somehow finds time for other commitments. He signed an endorsement deal with Warrior Sports after forming a relationship with CEO David Morrow during his time with the Denver University Pioneers. Berg is featured prominently in the promotion of the Warrior Warp lacrosse head, which has been gaining popularity at all levels. 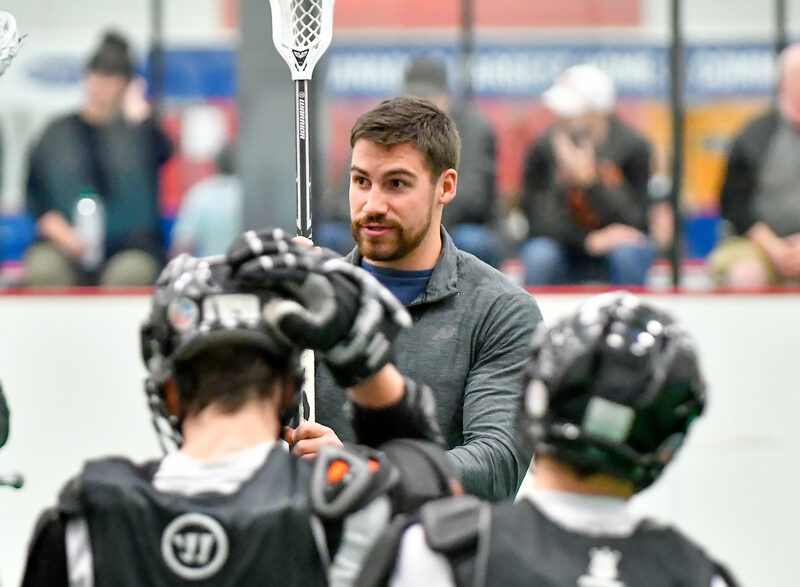 He sees the consistency of the Warp as an excellent tool for helping young lacrosse players learn to play the sport and keep them playing instead of quitting because of a poorly strung stick. Between playing and coaching, it’s a whirlwind life for Berg. When the Calgary Roughnecks’ season concludes, Berg leaves for Oakville, Ontario, to join the Rock of Major Series Lacrosse. In addition to Oakville, the 6’2 Coquitlam native also plays professional field lacrosse for the Denver Outlaws of Major League Lacrosse. For the summer, that house in Burlington is the launching pad for dozens of road trips. MLL games require long flights to and from Denver, Florida and now Dallas. Away games for the Oakville Rock mean riding a bus for hours to play in Peterborough and Six Nations. As the summer winds down and the playoffs begin, the Rock are matched up against the Six Nations Chiefs in the MSL semi-finals. The series goes the full seven games, but in the final game it’s the Chiefs who come out on top 11-7. Berg ties for the team lead in playoff scoring with 10 goals and eight assists for 18 points. In Denver, the defending Steinfeld Cup Champions appear in the finals for the second year in a row. In a one-game playoff against the Ohio Machine, Berg scores three goals and adds an assist but unfortunately the team comes up short 17-12. The loss brings an end to the summer season of lacrosse. 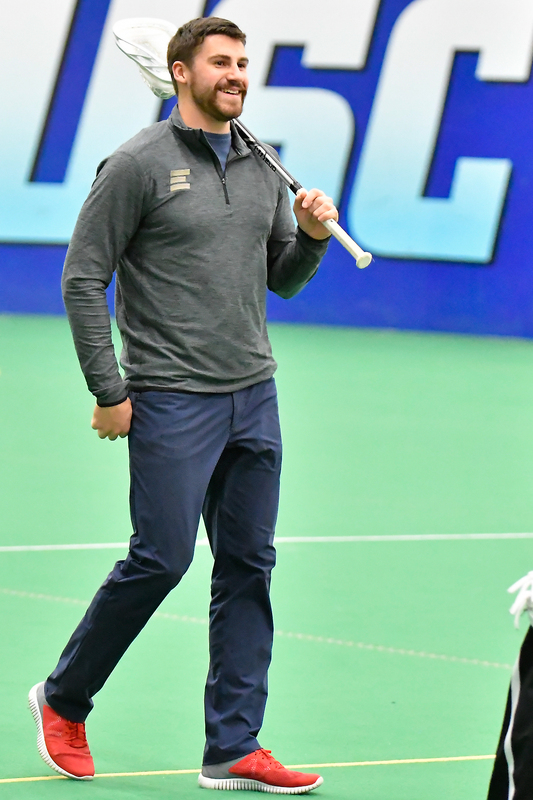 With one last stop in Buffalo for Team Canada tryouts for the upcoming FIL World Championships in Israel, Berg then turns his attention back to the NLL and preparing for the upcoming season. As training camp opens in early November, the third-year NLL forward has yet to re-sign with the Roughnecks. For the first time, Berg finds himself sitting out training camp while he negotiates his own contract. 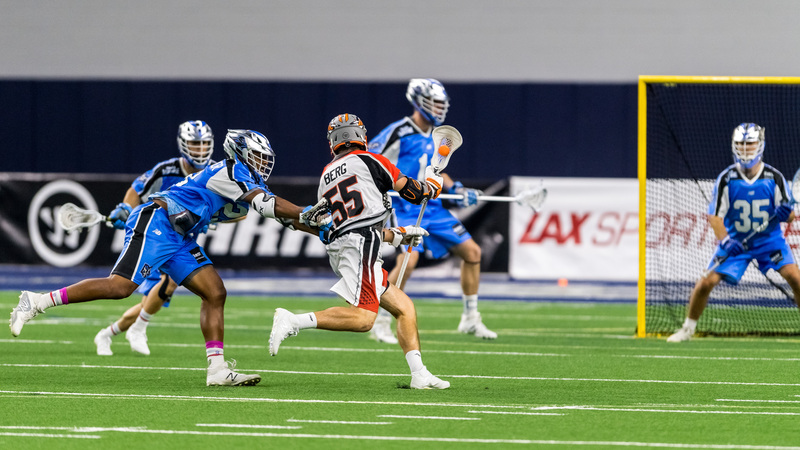 The Roughnecks placed Berg on the Protected Players List as the process continued through November and into December. For the most part, there isn’t a lot of negotiating room in NLL salaries. Most contracts are standard offers depending on factors such as years’ played and position. It has become an accepted stereotype that lacrosse players are just happy to play regardless of salary. That’s part of what gives lacrosse its appeal, but for the players it can be a dangerous profession. A bad injury can end a career and leave a player with little compensation. With the season opener just days away, the two sides reach an agreement on a one-year deal. The return of Berg for another season was welcome news for the Roughnecks and their fans. The talented forward has scored 69 goals and 162 points so far in his short NLL career. He has seven goals and nine assists in five games this season, second on the team. However, what is sometimes forgotten is the impact a player can have in the community. Perhaps it’s the next generation of lacrosse players who have gained the most from Berg’s return to Calgary. His passion for the game and willingness to mentor the next generation is what makes Berg an intangible part of the Calgary lacrosse community. So, as practice ends for the night and the athletes filter out of the arena, Berg says good-bye to every player as they pass by. It’s 11:00pm by the time he gathers up his gear, brushes the snow off his truck and heads home, but it won’t be long – mere hours, probably – before he’s back on the floor.